Grammie always made a Swedish Christmas Braid for Christmas morning. I have been making them for our family for about 5 years now, more or less, and they are a favorite holiday tradition of mine. I usually make it on Christmas eve and then leave it out overnight for french toast in the morning, or just with butter and jam. I love the idea of baking it fresh in the morning, but there is no way I can get up that early. 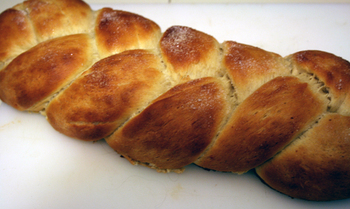 I guess I could do the first rise and then braid it and then put it in the fridge overnight. Then I could take it out and do the second rise Christmas morning. That would work. But this requires a bit more brain power than I seem to have during this time of year. 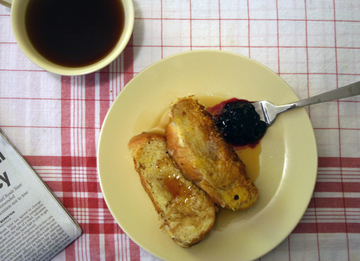 Here it is as french toast yesterday. I froze it. And I have to eat it with jam. Cardamom, which is the spice in this braid, is a wonderful flavor to me. I like to use it in apple pies, but don't very often because it always disappoints someone. "Why does it taste soapy?" Hmmm. That's the nice version. "Why did you ruin a perfectly good apple pie?" is probably what is really meant. This also happens when I add orange rind to chocolate chip cookies. Which is pure heaven in my book. It's getting to the point now that I splint a batch in half, one with the orange rind, one without because I love the orange rind so much. I like to avoid making gender generalizations, but it's interesting to me that men seem the most offended by orange rind in my cookies. Or baked goods in general. The most upset I ever saw Pete in a restaurant was when his waffles came with orange rind in the batter, which wasn't described in the menu. I think not knowing it was in there is what did it, but still, he was pretty aggro. Grammie says women like citrus flavors way more than men. Grammie is the master of sweeping generalizations, a quality I absolute love about her, and I make my share as well. What's best is that we never remember saying these things, so when people quote us back to ourselves later we always say "Did I say that? I didn't say that. I must have been smoking crack." But, back to citrus. . . is this true? I love citrus in baked goods and love lemon tarts and all that but the men I know really don't get all excited about a lemon tart. Or orange pound cake. But good ol' chocolate cake? Yup, that goes over big. The Swedish Christmas Braid recipe I use I posted here on flickr last year for the December Tie One On submission. Oh, don't forget the polka-dot aprons for Tie One On are due February 1st! Perfect theme for Valentine's Day, huh?